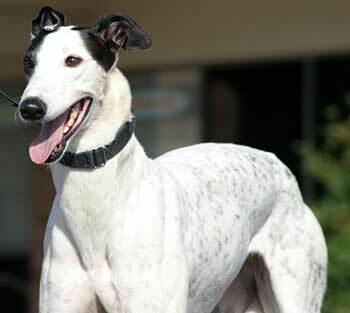 Dotty is a cute, 3-year-old female, white with black ticking, who was born on June 15, 2004. Her sire is Iruska All Star, and her dam is Souda Bay, making all of her lineage on that side being Irish bred. Although four of Dotty's siblings are registered with the NGA, Dotty was not. She was found as a stray and picked up by Fort Worth Animal Control. Several days after her arrival, to everyone's surprise, Dotty miscarried a male puppy that looked just like her. She tested positive for Ehrlichia, completed her treatment, and will need to be monitored periodically for the rest of her life. Dottie is not small animal or cat tolerant. This black and white beauty is the epitome of cuteness, and has a wonderful personality to match! 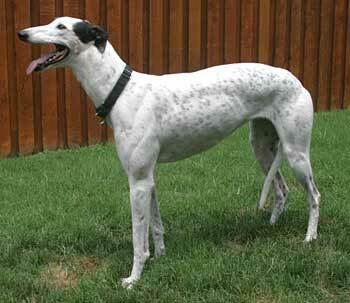 Dotty loves to lounge, but she also enjoys playing with other dogs, be them greyhounds, labs, or anything her size. From the moment she walked into our house, she fit right in among our "pack," never having a single issue with another dog in the months we've had her. Dotty loves to go for walks and is very good on a leash. She stays right by your side, occasionally looking up at us to make sure we're paying attention. Hold on to the leash, though, as Dotty loves to chase anything small, like squirrels or rabbits! Dotty is crated during the day when we're at work, but has free run of the house while we're home. She sleeps quietly on a dog bed in our bedroom at night, and has never asked to get on the furniture (although I'm pretty sure she'd love to sit in our laps when we watch TV!). If it sounds like there aren't any complaints about her, you're right! 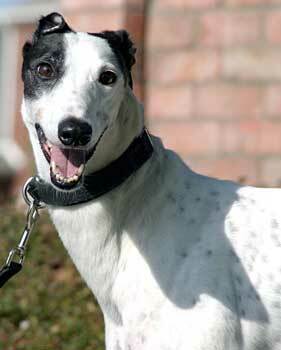 This little girl deserves a wonderful home to match her beautiful exterior and "greyt" personality! The Edwards have had the pleasure of helping GALT by fostering a foster for a few days. This little fosters name is Dotty. It would be remiss of me not to share my thoughts, feelings, and experience with this fine little girl. I placed a standard size pillow in her crate to keep her nice and comfy while we are away at work. The other night while doing some sort of chore, I noticed the same pillow on our family room floor. Being curious, I asked my husband if he brought it in for Dotty. "No" was his answer. The pillow was placed back in the crate only later to be lying in front of the television. Not once did we see her carrying the pillow around, but we sure were wishing we had had a video camera hidden someplace. Sometimes I catch her looking straight at me with the kind of look that reels you down to her level for lots of hugs. When I stop petting her she then tries to get in my lap. Dotty has been going on two walks a day with her newfound friends Vance and Gaye. She actually does better than our two! She prances along with head held high, not stopping at every mailbox and blade of grass. She's probably looking up at the trees for squirrels because this petite girl is very, very keen! In closing, Dotty may appear shy at first, but with some patience she will surprise you and steal your heart!